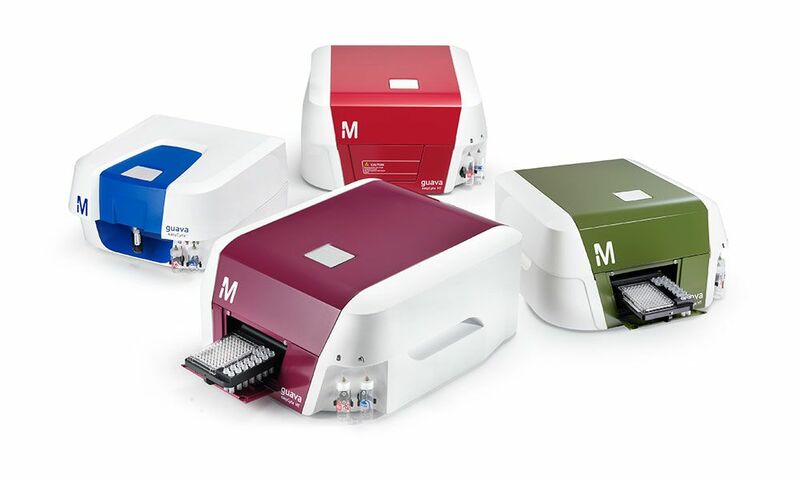 Guava® easyCyte flow cytometers from MERCK LIFESCIENCES use novel microcapillary technology that enables a compact, user-friendly format powerful enough to run your most complex assays. Microcapillary flow cytometry systems are simpler to operate than traditional sheath-fluid based instruments and are far easier to maintain. They utilize small sample volumes, generate minimal waste, and have lower operating costs. Absolute cell counts are a distinct advantage of direct sampling, and automatic cell enumeration is returned from every sample acquired on a Guava® cytometer. A positive displacement syringe pump enables not only direct sampling, but can adjust the flow rate as well to ensure clear data from a range of sample titers. New, more robust lasers available in virtually any combination mean that you choose the excitation and emission channels that are a match for your lab’s experiments and budget. All of our versatile optical configurations are available with an affordable single-sample loader, or an integrated multiwell sample tray option (Guava® easyCyte HT series), for trouble-free walkaway acquisition of up to 96 samples as well as upto 10 sample tubes. As a result, Guava® easyCyte flow cytometers are uniquely amenable to on-demand use in the laboratory environment and have helped many scientists achieve insightful cellular analysis since 1998. Do you need a flexible, intuitive, and affordable flow cytometer?